THINGS TO SEE AND DO: MAKE A GIANT SAND OCTOPUS. 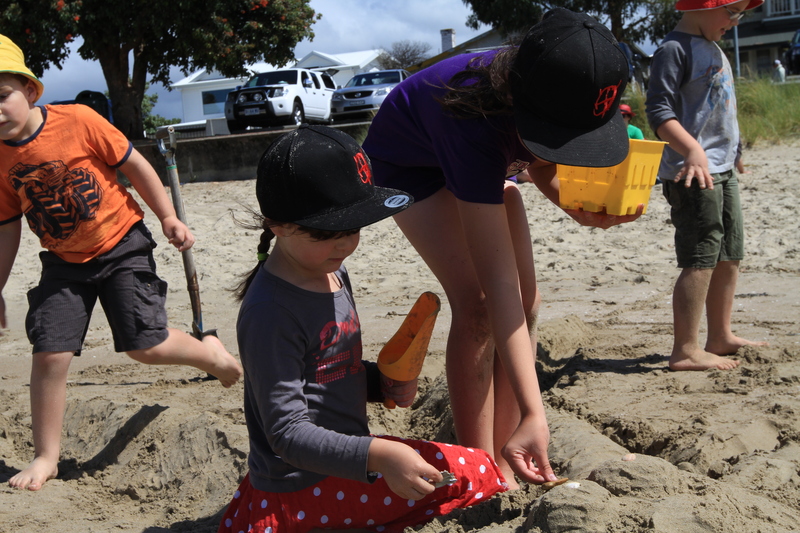 We have built large sand sculptures before, and they are a great hit for the young construction workers. This time however we had a change in focus beyond a simple sculpture, we want to talk a bit about camouflage. We chose an appropriate spot and drew a large circle in the sand (for the body). Each child took control of one tentacle (mapping it out and digging around their shape to pile it up as a long 3d sand arm). We didn’t have 8 children building tentacles at once so this allowed for some great maths questions during construction; how many have we made now? How many do octopuses have? How many more do we need to make? As the tentacles shaped up the kids moved on and created the body and eyes in the centre, decorating with shells. The small group used great negotiation techniques throughout the process to organise themselves to finish the octopus, helping each other when they needed it, and collectively deciding on plans. When we came to the idea of camouflage we stayed on the topic for a little longer. We talked about what would be good camouflage for an octopus, and how it can manipulate the shape of it’s skin to form different textures. It can change the shape of it’s body to mimic other creatures, and can even change the colour of it’s skin to form different patterns to blend into it’s surroundings! No other creature has all these camouflage skills. In our case we talked about our octopus being ‘camouflaged’ in the sand around it, but over the next couple of days we will revisit the concept as the opportunities present themselves. (See how that bird blends into it’s background? Why do you think that tiger in the book has stripes? What makes good camouflage? Why is it important for each of these animals to be able to hide?) Camouflage is a topic that is of great interest when learning about animals and it will come up time and time again as we work our way through the year, and a physically active project of building a sand sculpture is a fun way to introduce it! BIG HISTORY CONCEPTS FOR LITTLE TOTS. We’ve talked before about the importance of introducing a bit of ‘big history’ into early learning, and with everything from the dinosaurs to when mumma was born classed as ‘the olden days’ this project will help give a little perspective to our place in time. Our strategy for the year is to provide some understanding of big history concepts. We have created a time line on one wall and as we come across facts, figures, dates and details we add them to our timeline. When we visited a cave (that began forming tens of millions of years ago) we added that to our timeline, giving the experience even more historical wonder than the simple beauty they saw. When we talked about how the waterwheel that was used to make flour in the ‘olden days’ we were able to add that to our time line and see that it is relatively recent in our history. When the kids asked when the first person was born (being a believer in evolution rather than creation) we added that to our timeline and could explain the idea of evolution far more simply when they could physically see the degree of time passing and the changes happening. We have left some space for the future too, so they can imagine and dream about what might be in store in the near future. We hope to get to this after a few more history concepts are visited. (Over the coming months as we work through the letters we will look back at the first civilizations, dinosaurs, and so on). I am also excited to see a few more concepts overlapping (ie “this was happening at the same time the pyramids were being built” etc). To solve this problem of scale we ‘expanded’ our little dot of history into another timeline to allow for more detail in the human history. We used a coloured ribbon for each timeline (blue for the overall time line, with a dot of orange at the end. And orange for the human history.) This colour reference made it easer for the little historians to understand that the orange line represented that tiny little dot at the end of the blue line. We marked up our history over a 3m stretch of wall, simply using chalk directly on the wall to label the periods in time, and to add new concepts. When adding new ideas the little historians often create an image (painting, gluing, drawing etc) and we blue-tack that image to the wall at the relevant place on the timeline. This visual cue that they created is far easier for them to remember and explain to the other adults in their life than a simple text ‘entry’ on our timeline. By re-visiting the concepts as they explain their work they re-enforce their understanding of what they have learnt. Separated at 100 million year intervals. 10,000 years (before common time) – until the year 3,000. *Please note; the beginning of ‘human history’ that we expanded is determined at a point where there are some interesting things to add to the timeline (ie beginning of farming etc) rather than the beginning of Humans as a species. For practical scale reasons we found this to be more workable as it allowed a little more space between centuries once scaled to fit our space. While my own little historians are not the ‘remember exact facts and figures’ type of learners, that is not our primary goal. Our aim with this timeline is to give the little historians a sense of their place in history. A sense of belonging in something much greater than themselves, an idea that things change gradually over time, and (as we enter further into human history) some understanding of how they can alter the future by their own actions. A sense of belonging in time (as well as in space, community, culture etc) is vital for growing our young people into the adults we want in our world. O – IS FOR FREE OCTOPUS COLOURING FROM TASSIE ILLUSTRATOR! In the mean time shoot on over to Facebook and send her a Like to keep up to date with what she’s creating, and to say a big thank you for sharing this lovely work with us and our tots! 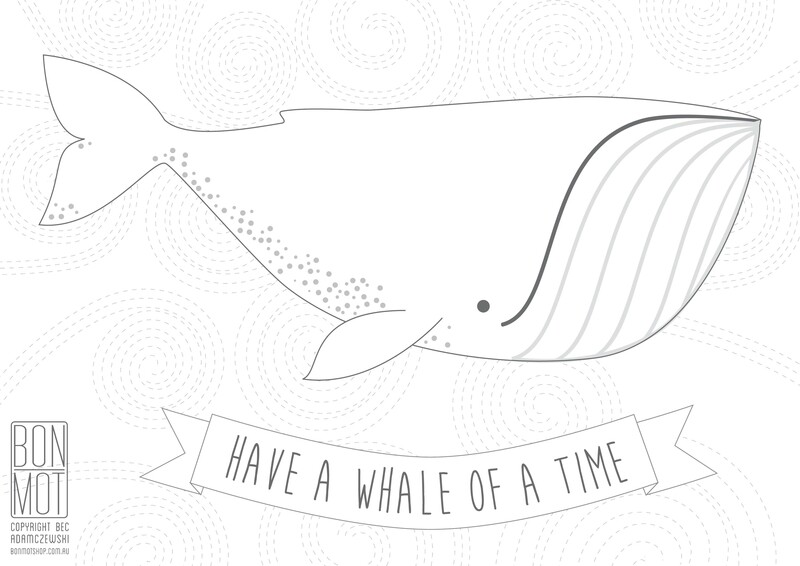 W – IS FOR FREE WHALE COLOURING FROM TASSIE ILLUSTRATOR! Shoot on over to Facebook and send her a Like to keep up to date with what she’s creating, and to say a big thank you for sharing this lovely work with us and our tots! Enjoy your colouring and look forward to seeing you for the letter O next. 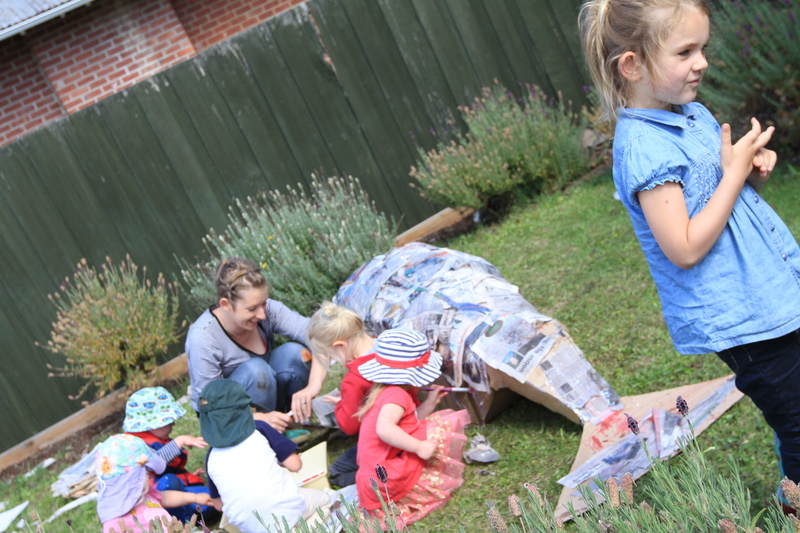 EASY ACTIVITIES TO BUILD YOUNG BRAINS: MULTI-SCHOOL GIANT WHALE PROJECT. This is a not quite as big as a real blue whale, but it certainly is a monster project (unless you are working with a large group, or have an enthusiastic marine biologist on your hands, you may like to scale this one back a little – the Blue Plate Whale is a smaller one to do at home!) First, fashion a ‘box whale’ from a few cardboard boxes and lots of packing tape. The exact shape of your whale will be determined by your boxes, but we found it far easier than initially imagined to make the basic whale shape. (We also used some packing to help support the inside of the shape, though this was more about what happened to be in our boxes rather than something you need to seek out.) We then had a little more ‘softening’ to do before our box looked truly like a whale. We scrunched newspaper and taped this down with sheets of paper (like wrapping a big newspaper present!). We did this in any places our whale needed a few more ‘curves.’ Once the shape is achieved mix 1part water ; 1 part PVA glue in a tray. Tear paper into more manageable pieces and dip in the glue before placing over your whale. Aim to overlap your paper for strength and cover as much of the whale as possible. (Our young sculptors were not so focused on the idea of overlapping for strength, but their enthusiasm for covering the top of the whale meant that it happened anyway!) Your whaled dry time will be different depending on the thickness of your layers. Ours took about 4-6 hours to dry on a sunny day. Once dry we painted our whale (blue of course!) and the squelchy squashy finger paint was a hit, as always. This particular whale will then visit my 5yos Prep class soon, for a little more decoration and as they are investigating sea creatures at the moment, it will then come back to us for an under the sea birthday party, and then find it’s home at the daycare centre – not bad for a bit of news paper, a few old boxes and lots of little enthusiastic hands! We’ve talked before about our mission to cook around the world, but in this case we are baking the actual world it’s self! To link in with our concepts surrounding volcanoes (inspired by our destination of the week; the volcanic islands Wallis and Futuna) we’ve been investigating the layers that make our world. The inner core is the hottest (imagine the seed of a tick skinned fruit) the outer core is still darn hot, but a little cooler than the very centre (think of the flesh of your fruit) then there is the far thinner crust of solid, hard rock (imagine the skin of the fruit) and on top of that are all our oceans and islands. That’s our world in a fruity sense, but we decided it would have a more memorable impact on our learning to EAT CAKE! I’ve reflected a little in the past about the importance of a ‘Purple Cow’ approach applied to learning activities (that is, a thing so remarkable that you actually remake on it, and then by re-telling that exciting story you wire those nurons again and again). It’s a marketing concept (by marketing guru Seth Godin) combined with the brain science (best explained in easy reading books like The Whole Brain Child By Dan Siegel and Tina Payne Bryson). While you might not want to fill your kids up on sugar every time you learn a new concept, tossing in a ‘purple cow’ now and then (something they’ll be excited enough to talk about) will enhance their learning as well as bring a wide grin to their faces. Mix all. Bake at 180 until a skewer comes out clean. We doubled this recipe (making 2 sides of the globe) though I have left it in it’s single form. 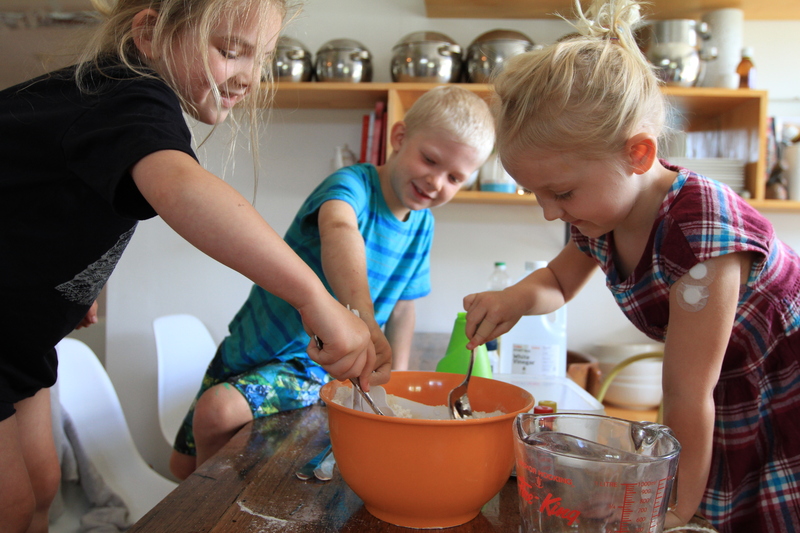 The task of doubling the recipe was given to the 5yo, who (on top of the usual measuring and mixing) enjoyed the challenge of a little extra numeracy. The fraction was a little too advanced for her, but she was able to deduce that 2 halves were one cup, and 2 quarters were half when it was broken down for her. Fractions is not really something that she needs to concern herself with in terms of formal learning, but introducing the concept in relation to cooking (where there are so many fractions!) is a great place to begin to build her understanding. We then separated the mixture into 2 bowls and each child was responsible for mixing the colour for a different layer in the centre of the world. One for the inner core (red) and the other mixed the outer core (yellow/orange). This sense of ownership (and also colour reference) came in particularly handy when we re-visited the concept of layers later. We piped our inner core into the centre of each tin, and then popped it in the oven. 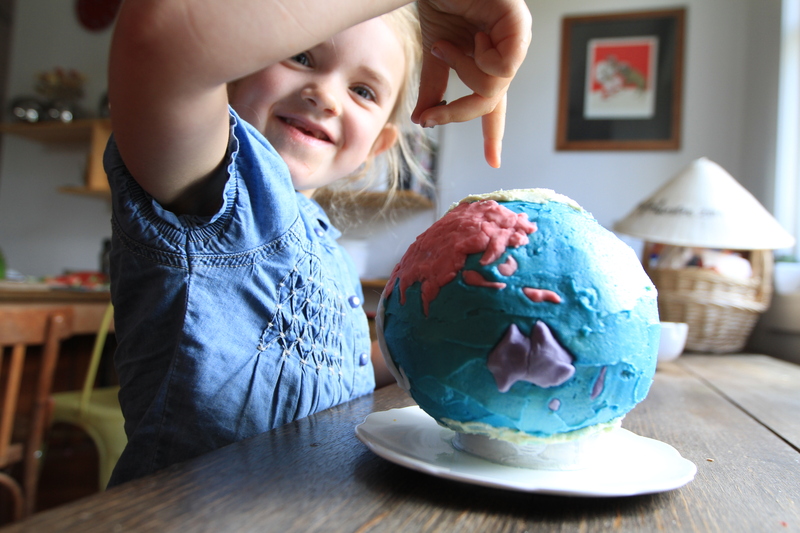 We then iced the world in blue butter icing, and made some (roughly shaped) continents to place on our world. To create the continents we printed this map, taped it down with clear plastic on top. The kids then filled the continent shapes with fondant (we happened to have some coloured fondant left over from a cake, but most supermarkets also stock batches of ready made pre-colourd fondant in an easy pack). The kids learnt the continents more than I thought they would from this exercise, more than I thought they would. They also took a lot away from the concept of a world made out of layers. When entering a cave they asked if we would get far enough down to see the lava, and each time we talked about the layers after they would tell me ‘that’s the one I mixed’ and so on. 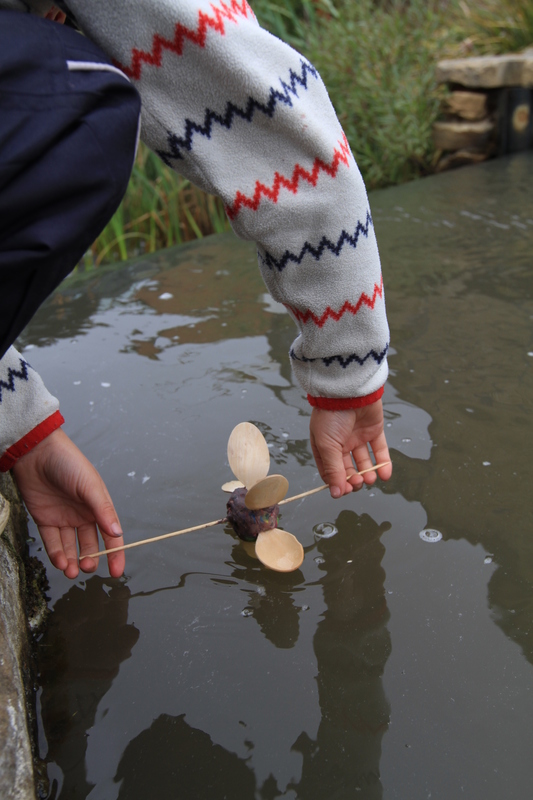 THINGS TO SEE AND DO: VISIT A WORKING WATER WHEEL AND MAKE ONE TO TAKE HOME. We’d like to note that W is also for Whisky, and while taking children to a distillery is not usually seen as a positive parental moment – that’s exactly what we did and it was fantastic! Nant Distillery has one of the oldest functioning water wheels in Australia and is well worth the journey just for the sake of the kids – even if you don’t like Whisky yourself! (Nant is in Oatlands, about 1 hour road trip from Hobart). The entire mill (originally used to mill flour) has been fully restored as a working barley mill. The water wheel is made up of original parts and is easily seen from the outside (where the stream moves the wheel) and shop area (where you can see the cogs turning as result of the water moving the wheel). All this is free and visible even without a tour of the building. 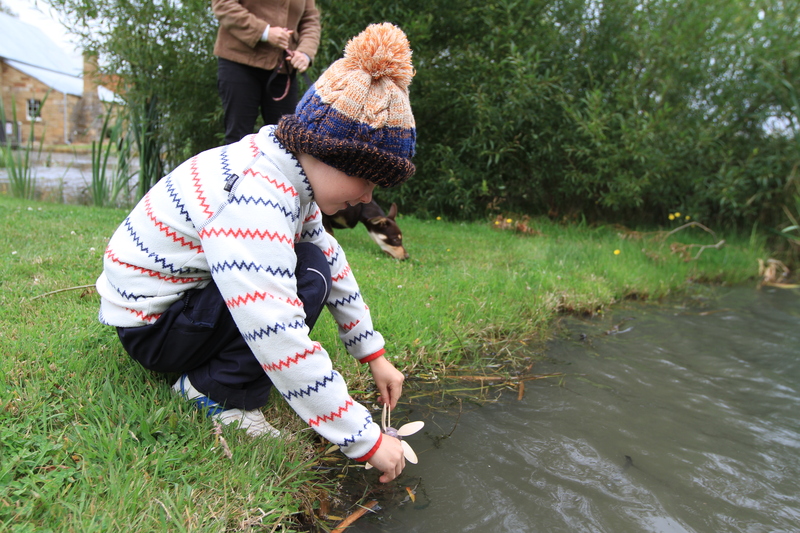 We were lucky enough to be spotted making our water wheels and the kids were given a full tour of the premises by the friendly staff before we sat down for hot chocolates… truly a wonderful day for the whole family! Now, while I whole heartedly recommend making a family day trip to Nant to check out the function of a real water wheel, here’s an activity that you can do in the bath if you don’t happen to make it to Oatlands today. Your water wheel is made! We first tested ours in some still water to see what would happen (nothing) then in some slow moving water (still nothing). We asked the kids what they think needed to happen to help move the wheel around. Faster water! We talked about how that energy could be used. To make power was the favourite answer (after our talks about wind creating power). We were then also guided through the rest of the distillery to see how the barley is ground, and eventually made into whisky. The mechanisms are beautiful to admire, and our guide perfectly matched the informal nature required for a tour group as young as ours! A wonderful day out that was finished with a hot chocolate and gallivanting around the greens. Our trip home was the perfect time to chat about what we had seen, think about how much power water holds, what water is in different forms (ice, liquid, steam etc). We also touched a little on the gravity that makes water always run to the lowest point (gravity of planets being a recurring theme but a new and rather abstract concept for the kids when talked about previously in our space activities.) The car is always a nice place for questions, and after our activities the kids had plenty! 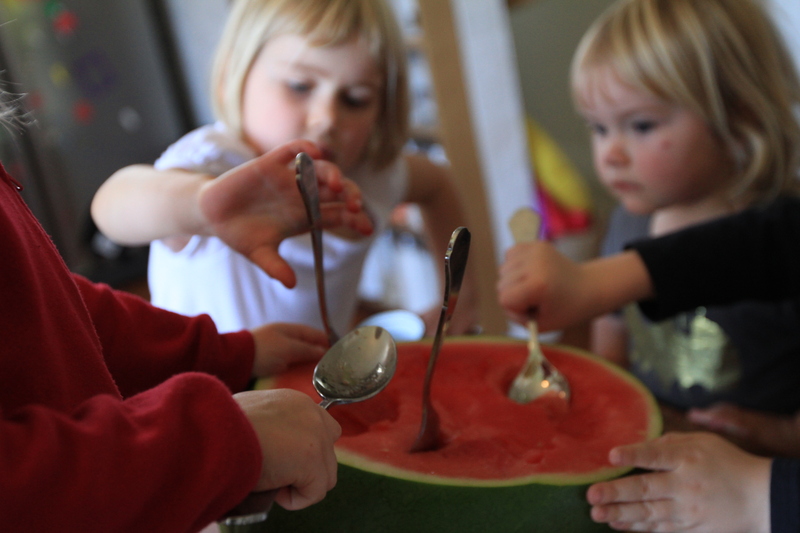 EASY ACTIVITIES TO BUILD YOUNG BRAINS: MAKE A WATERMELON WHALE. Use part of the wedge that you have just removed (from the mouth) to fashion a dorsal fin (if your species of whale has a prominent one). We used the ‘base’ as a tail. Cut some eyes and a blow hole (a good time to talk about how they are mammals like us and need to surface to breath). Our whale was carnivorous and Anica thought it was hilarious when it ‘ate her arm’ (she photo above). Elka, however was later found eating the whale’s teeth one by one, she REALLY likes her watermelon! 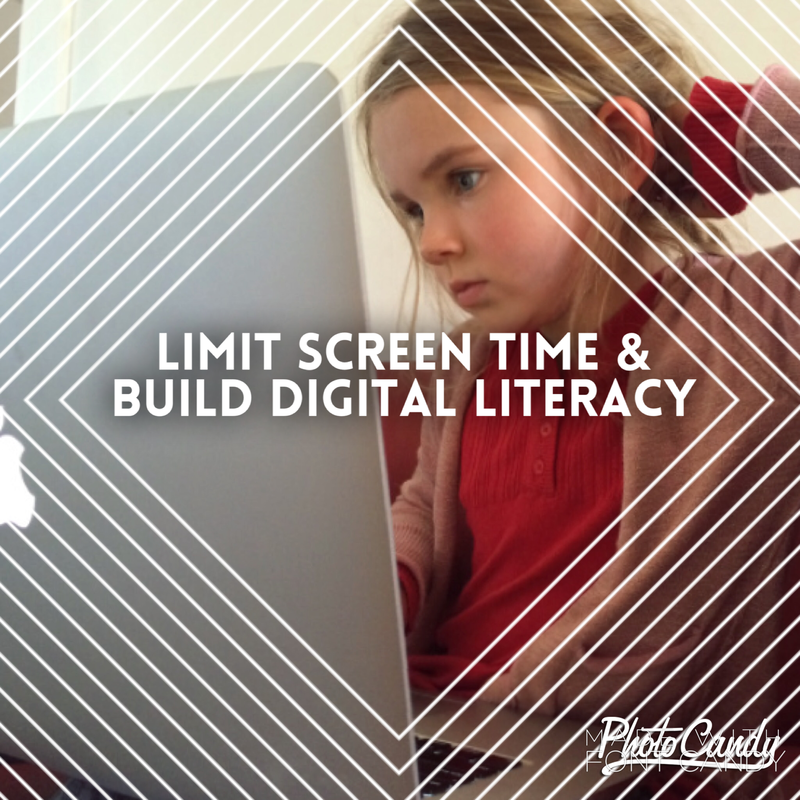 HOW TO LIMIT SCREEN TIME WHILE BUILDING DIGITAL LITERACY. Screen time, it’s an issue that we all confront. An issue that is changing drastically in our kids short lifetimes. I highly recommend listening to this segment from our favourite radio host Ryk Goddard speaking with Professor Stephen Houghton on ABC Radio. On the other hand we also want to prepare our kids for the future, and building their digital literacy is an important part of that. For a little listen on this front you might like to click over to this segment where ABC Radio’s Rachael Brown speaks with Jillian Kenny about how Australian students are chasing non-existent careers. As many of you may know, I have spent a good deal of my life creating videos for a living. (Everything from film clips to schools programs on drug education – a wonderfully divers and mind-blowing job). Yet when I had my first child we didn’t let her watch TV or videos. Even now, with a 3 and a 5 year old, we still don’t have a TV at our home. With less than 5% female representation among professional coders (and indeed; low representation across all technology fields) I actively want my daughters to be given every opportunity to “think like a coder”. Fortunately for us my brother is a software developer and has been able to introduce my children to the simple puzzles that allow them to gain the first basics of code. Like any activity for children, these games are fun, playful, challenging and lets them solve puzzles of increasing difficulty. Watching the intensity that my 5oy has when solving these puzzles I am in no doubt what so ever that her analytical brain is building at a rapid rate during this type of screen time. Puzzles that are programmed to respond and change individually with the child’s developing mind is far more advanced than ever before, and indeed personalised development supersedes any previous notion of following a precise generic sequence of puzzles laid out in a work book. Physical interaction with the screen is something that is not taken into account with many of the previous studies done into kids watching TV. 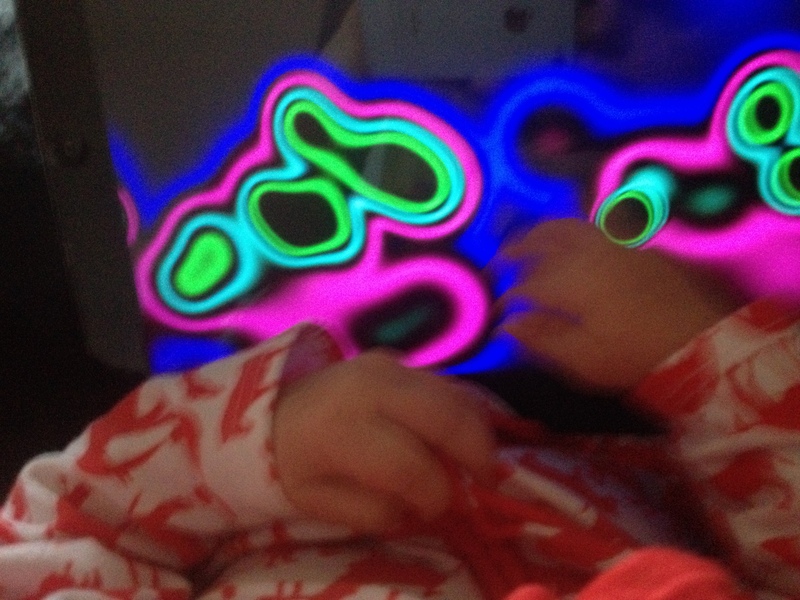 A 3 month old who is learning the finer points of controlling her fingers was held in front of a touch sensitive light pad, and her little arms went wild as she discovered the colours she could create by touching the screen. She explored fine details, sweeping motions and saw what her actions could make. Very few parents would be willing to let their 3 month old baby loose with finger paints, and yet this (less the valuable tactile squashy feeling she will get to experience a little later in life!) was exactly what she was doing. She was painting with light, learning physical control and the relationship between cause and effect. The ‘screen time’ was giving her an opportunity to do something that she would otherwise not have been able to do. Screen time will never replace the learning that is achieved with direct human interaction, but when used as an age appropriate tool (rather than a substitute) the learning potential is immense and to be encouraged. This TED talk by Salman Khan is a great look at how screen time can assist rather than hinder in an older educational setting. Let’s sit and watch something. This is the one we all feel a little uncomfortable about, myself included, and yet in smaller doses I believe that this entertainment is a valuable and important part of growing up. In recent discussions about volcanos my 5yo clearly explained to me the cause of hot springs, volcanos, and tectonic plates (while she was missing some of the technical terminology, her understanding was surprisingly comprehensive!) I asked where she had learnt this – perhaps school? Or did her grandparents explain it to her? No, it was the “dinosaur train” – one of the shows my kids like that I am the least enthusiastic about but in watching it she has gained a conceptual understanding of the Earths structure that astounds me. I am careful about what my children watch for entertainment because I can directly see the themes and relationships shown being re-created in their games, wiring in to their understanding of the world. But I also know it is important that they have a connection with those around them. I myself grew up largely without TV and radio, and while that had a great impact on my life, my adult friends often need to explain cultural references that I miss because I do not have the same “cultural background” as them. The entertainment of a culture is part of that culture, thus TV watching (even the trashy kind!) is part of growing up and being a part of this culture too. In a sense, it is important for my kids social and emotional development that they know who Elsa is, but they don’t need to watch Frozen enough that they model themselves on it! Of course, none of us will know how this new kind of screen time effects our young ones until many years from now, and indeed what ‘screen time’ is will continue to evolve at a rapid rate, but this is how I personally navigate the current screen time dilemma. Love to hear how you are approaching this with your young ones. EASY ACTIVITIES TO BUILD YOUNG BRAINS: BUILD A VOLCANO! Volcanos in the Pacific – a tactile science experiment for kids of all ages. Wallis and Futuna are two small island groups in the South Pacific between Fiji and Samoa that were settled by French missionaries at the beginning of the 19th century. It is now classed as an “Overseas Territory” of France and there are 3 kings who assist in rule with a parliament of 20. While Wallis and Futuna are not necessarily a “country” in a technical term, they do have one very exciting element that can’t be missed in any child’s upbringing… Volcanos! Futuna in particular is a volcanic island, and thus we can’t pass up the opportunity to bring out the baking soda and vinegar experiment that we all loved so much as children. Now, if you need a refresher on volcanoes (also linking up that big picture by making clear links to the work we’ve been doing around the sea and space) then check out this video (with or without your child, depending on how old they are and how much they watch). When you conduct this experiment, you may wish to focus entirely on the power of volcano’s to form the land (such as the islands Wallis and Futuna) but if you have a budding chemist in your group, then you might want to take it further and conduct a series of volcanic experiments to asses the chemical reaction in their own right. Ie Bicarb and water (no visible reaction), Bicarb and vinegar (bubbles), Mentos and diet cola (explosive bubble reaction). Having read a little about chemicals with the 5yo, I was surprised that she later formulated a hypothesis about the volcano that was quite accurate; She thought that there was a chemical reaction that made a gas and that created the bubbles that she saw. While this is probably not going to be a fact that she remembers later, the process of linking known information and apply it to new situations and observations to form a new hypothesis is something we want to encourage at every point possible on the road to adulthood! We’ll later have a little road trip to look at more detail about where the heat for real Volcanoes comes from, but this little science experiment is a great place to get those little scientists thinking!